The University of Southampton has awarded an honorary degree to Jane Bown, one of the country's most famous and best-loved photographers. 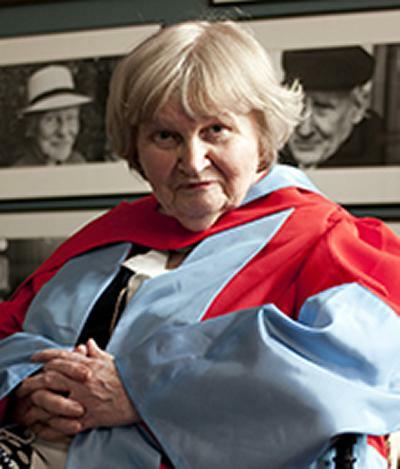 Uniquely, the ceremony to award Jane's honorary degree of Doctor of Literature was held not on campus, but in her home at Alton in Hampshire, in the presence of Vice-Chancellor, Professor Sir William Wakeham; Pro-Chancellor Dame Valerie Strachan; and the University's Public Orator Professor Helen Simons. Jane Bown worked for The Observer newspaper for over 55 years from 1949, working primarily in black-and-white and using natural light. Her years at The Observer have been described as 'a romance between Britain's oldest Sunday newspaper and the country's most loved photographer'. Her iconic black-and-white photographic portraits are still regularly featured in the newspaper's Review section in 'Jane Bown's photo archive'. In 1980, Jane's reputation as a photographer was so firmly established that a solo exhibition of her work was held at the National Portrait Gallery, and there have been no fewer than seven published collections of her photographs. She has photographed hundreds of subjects, including Queen Elizabeth II for her 80th birthday, Orson Welles, Samuel Beckett, Sir John Betjeman, John Lennon and Richard Nixon. The University hosted an exhibition of Jane Bown's own prints of her Observer portraits at Winchester School of Art in 2003. The event was part of Winchester Festival, and the subject of a lively education programme for local schools.